January 20 – 21, 2019, beginning at 9:33 pm, with full eclipse beginning around 11:40 pm. VENUS – High and Bright! Venus will be found easily int the pre-dawn sky, rising around 3:30 am at the start of the month and 4:15 am at the end. Super easy to identify as it is the brightest object in the morning sky (besides the Sun and Moon). Venus will be at its highest in the sky this month. Big binoculars or a small telescope should reveal the phase of Venus. MARS – conspicuous and easy, but fading away. As Mars keeps moving further away from the Earth it will continue to appear smaller and dimmer in brightness At this distance it will be difficult to see any surface detail in small and medium telescopes. It sets around 11pm. JUPITER – The King is back! Jupiter rises in the predawn East around 5:15 am at the beginning of the month, and 3:45 am at the end, so observing should improve as Jupiter climbs higher in the sky with time, and will continue to improve in the early morning sky during the coming months. SATURN- Not until the end of the month. You may get a peek at Saturn very low above the south-eastern horizon during the last week of the month, as it re-emerges from behind the sun, but it won’t be easy because it will be so low (around 8*). It will continue to improve in the morning sky during the coming months. URANUS past Opposition, but still a good evening object! Opposition for Uranus was October 23 so it is still fairly big and bright…for Uranus! Uranus is still easy to see with binoculars this month, and visible throughout the evening into the early hours, but will continue to get lower in the sky as time goes by. Use a tripod to steady the binoculars. It sets around 1:40 am at the beginning of the month, and around 11:40 pm at the end of the month. It is a beautiful turquoise color is great through binoculars or a telescope. NEPTUNE – Never easy…but worth it. Neptune sets around 09:45 pm at the beginning of the month and around 7:50 pm at the end. You will need binoculars or a telescope to see it, shining at magnitude 7.9 in Aquarius. Make no mistake; it is not easy and you will likely need a telescope of 8 inch and larger aperture to resolve the planet. It is very far away and very dim. The Quadrantid meteor shower is expected to peak on the night of January 3rd – 4th 2019 though meteor activity may occur for two or three days on either side of this expected peak date. The New Moon on January 5th should help with dark skies. A short-period comet, Comet Wirtanen takes 5.4 years to orbit the Sun. It made a close pass (7.26 million miles) by Earth in December 16, 2018 and was barely naked eye visible when I was able to observe it from our dark Vermont skies. It will continue to be visible throughout the month but will fade away towards the end of January. – 12/12/18 Not so great seeing conditions. Comet Wirtanen was barely naked-eye visible from my location in Dorset, Vermont, if you knew where to look (above and to the left of Menkar, Alpha Cetus). Still quite faint, fuzzy, better defined, and no visible tail through 15×70 binoculars). A fair number of meteors tonight as the Geminids approach. – 01/02/19 Conditions have been quite cloudy overall during the past few weeks, however there have been a few occasions with brilliantly clear, dark skies for brief periods in this part of Vermont. At those times it has been wonderful observing! A short-period comet, Comet Wirtanen takes 5.4 years to orbit the Sun. It will make a close pass by Earth in December. Some speculation is that Comet Wirtanen could reach magnitude +3.x, making it one of the brighter comets in quite a while. If so, it might be visible to the naked eye in our dark Vermont skies. 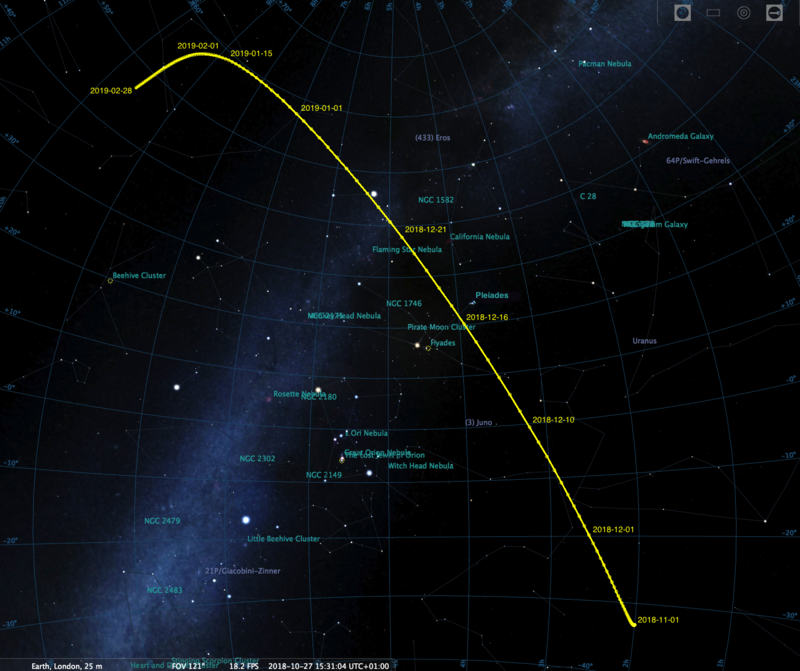 It’s closest approach will be on 12/16 when it will be 7.26 million miles from us. Look for a faint, fuzzy object appearing to travel between the Hyades star cluster and the Pleiades star cluster. – 12/12/18 Not so great seeing conditions. Comet Wirtanen was barely naked-eye visible from my location in Dorset, Vermont, if you knew where to look (above and to the left of Menkar, Alpha Cetus). Still quite faint, fuzzy, better defined, and no visible tail through 15×70 binoculars). A fair number of meteors tonight as the Geminids approach! MERCURY – A good chance to see this not-so-easy one. Mercury reappears in the pre-dawn sky from December 6th at a quite bright magnitude of +0.0 and high in the sky, rising around 5:40 am. Binoculars will be very helpful! By the end of the month it will rise about 6:15 am so earlier in the month will be better. Venus starts the month bright (magnitude -4.9) and high (30 *), and maintains good viewing all month long. Super easy to identify as it is the brightest object int the morning sky (besides the Sun and Moon). Big binoculars or a small telescope should reveal the phase of Venus. MARS – bright and easy, but fading away. As Mars keeps moving further away from the Earth it will continue to appear smaller and dimmer in brightness (from magnitude -0.0 to magnitude +0.4 by the end of the month). That said, it remains fairly high in the sky (around 25* at the beginning of the month and an elevation of around 33* on the Solstice). At this distance it will be difficult to see any surface detail in small and medium telescopes. JUPITER – He’s back! (Sort of). Jupiter will appear in the predawn East around the middle of the month. It will be bright at magnitude -1.8 but quite low in the sky and so not the best for observing. The good news? It will continue to improve in the early morning sky during the coming months. You may get a peek at Saturn very low above the south-western horizon during the first week of the month, but after that it will be lost in the glare of the Sun before it disappears behind the Sun. URANUS past Opposition, but still good! Uranus is still easy to see with binoculars this month, and visible throughout the evening into the early hours in the constellation of Pisces. It is around magnitude +5.7. Use a tripod to steady the binoculars. It sets around 3:30 am at the beginning of the month, and around 1:45 am at the end of the month. It is a beautiful turquoise color is great through binoculars or a telescope. Neptune sets around 11:40 pm at the beginning of the month and around 9:45 at the end. You will need binoculars or a telescope to see it, shining at magnitude 7.9 in Aquarius. Make no mistake; it is not easy and you will likely need a telescope of 8 inch and larger aperture to resolve the planet. It is very far away (2.795 billion miles at this time, and very dim (magnitude 7.9). The Geminids peak after midnight the 14th-15th . This shower produces lots of slow movers and some fireballs. The First Quarter Moon sets an hour or two before the expected peak. The Ursids peak late evening of the 22-23rd of the month. This shower is not great with a maximum hourly rate of about 10 to 15 meteors. The 12/21 Full Moon will not help. Still if you’re out there, keep an eye open for the bright ones. Around the 6th or 7th of November Venus will become visible as an early morning object, low in the East, but climbing higher, and getting brighter as the month goes on. Magnitude -4.6 early in the month, -4.9 at the end. Mars is well positioned for viewing all month. It will continue to grow dimmer as the month goes on (magnitude -0.6 to magnitude -0.1), pulling further and further away from us. That said, it will climb higher in the sky and so may actually present better viewing later in the month. This may be a good chance to see some surface detail through a telescope as the dust storm has cleared. Catch it before it pulls too far away from us! It sets around 1 am or so. Saturn can be spotted about 10* above the horizon in the SW around sunset at the beginning of November, setting around 8 pm (after the time change) at the beginning of the month, getting progressively tougher to spot as the month goes on. It is visible practically all night long during the month. It’s beautiful turquoise color is great through binoculars or a telescope. Use a tripod to steady the binoculars. MERCURY may be visible at the beginning of October but very low (4*) above the W around sunset, getting a little higher as the month goes on. Towards the end of the month, Mercury will be near Jupiter, as Jupiter prepares to disappear soon. Binoculars are the best way to spot it. At the beginning of the month, Venus remains very bright in the western sky around sunset, but is very low (around 5*) so any hill or trees will block it. By the middle of the month it will be setting before the Sun, but starting to reappear very low in the predawn sky by the end. Mars is well positioned for viewing all month. It will be low in the southern evening sky and will set after 1 am. Earth continues to pull away from Mars and it will continue to diminish in apparent size and brightness. The planet-wide major dust storm that has engulfed Mars for months has subsided so this hopefully will be a good time to see some surface detail before it gets too far away. A small telescope may reveal major surface details if seeing conditions continue to improve. Mars sets around 1 am or so. The King reached opposition back on May 8th, and continues to get smaller as distance grows between us, and it getting very low now as well. At the beginning of October Jupiter sets around 8:45 pm. At the end of the month it sets around 7 pm. Saturn sets around 11 pm at the beginning of the month, and about sets about 9 pm at the end. The rings are still at a great angle, and Saturn will be about 20* around sunset. Uranus, will be visible all night long during October, and continue to get closer to us, reaching opposition on October 23 when it will appear biggest and brightest. It will be a binocular target throughout October. Use a tripod to steady the binoculars. Recently past opposition, it should be visible all night long, and fairly high in the sky. That said, make no mistake that it is not easy and you will likely need a telescope of 8-inch and larger aperture to resolve the planet. It is very far away (2.7 billion miles [4.3 billon kilometers] at this time, and very dim (magnitude 7.8). MERCURY is visible low above the ENE horizon for about 45 minutes before sunrise during the first few days of the month, shining quite brightly at magnitude -1.0. On the 6th, Mercury will be very close to the bright star Regulus. By the middle of the month it will become lost in the glare as it moves even closer to the Sun. At best it is close to the Sun so the chance to see it doesn’t last long. Binoculars are the best way to spot it. Venus remains very bright in the evening sky around sunset, but continues to sink lower and lower as time goes by. Look for it in the WSW before sunset. It sets about 70 minutes after the Sun. It is very bright but increasingly will be fighting the Sun’s glare. Later in the month binoculars may be required to spot the planet. Still, a thing of great beauty! MARS Past Opposition, but still great! It’s true that Earth and Mars are now pulling away from each other but Mars still looks really, really great in the night sky and will for a while to come! Mars was engulfed in a major dust storm during August, blocking all surface details. That said, the dust storm on Mars is significantly improving but has not yet fully subsided. A small telescope may reveal major surface details if seeing conditions continue to improve. Look for Mars at an elevation of about 14 degrees ESE where it will shine at magnitude -2.1, reducing to only -1.3 or so by month’s end…plenty bright! At the beginning of the month Mars rises around 8:30 pm and sets at 5 am. Towards the end of August Mars sets around 2:30 am. The King reached opposition back on May 8th, and continues to get smaller as distance grows between us. Still he is The King and will be visible early in the evening, setting around 10 pm at the beginning of the month and about 8:30 pm by the end. It is still quite bright; around magnitude -1.9. Jupiter’s equatorial bands, the four Gallilean moons, and sometimes the Great Red Spot should make for a fun view through even a small telescope. All that said, Jupiter is now quite low on the southern horizon, so viewing is not going to be so good due to the thickness of Earth’s atmosphere at that elevation. Saturn sets around 1 am at the beginning of the month, and about sets about 11 pm at the end. The rings are still at a great angle, but the problem is the same as with Jupiter…it will be very low in the sky, never getting above 15 degrees so you will be looking through a good deal of Earth’s atmosphere while viewing it. Uranus, rises around 9:30 pm at the start of the month and 7:30 pm at the end of the month. It is visible all night and will be a binocular target throughout September. Use a tripod to steady the binoculars. Rises around 7:45 pm at the beginning of the month and 5:45 pm at the end, and therefore should be visible all night, and should be fairly high in the sky. That said, make no mistake that it is not easy and you will likely need a telescopes of 8-inch and larger apertures to resolve the planet. THE PERSEID METEOR SHOWER runs annually from approximately July 13 until August 26, with the peak on August 12. The best time for seeing meteors is after midnight. The meteors are debris from Comet Swift-Tuttle. The moon cooperating this year and should be absent at peak. Mercury starts the month behind the sun. The best chances to see it is later in the month (August 26 or so) in the predawn sky rising around 4:45 am. At best it is close to the sun so the chance to see it doesn’t last long. Binoculars are the best way to spot it. Venus remains the brightest object in the evening sky after the moon and can be seen in the west after sunset. Venus is getting lower in the sky as the month goes on as it pulls further away from us as time goes by, reaching it’s furthest point from us on August 12th. Still, a thing of great beauty, and after that it starts moving towards us again! It’s true that Earth and Mars are now pulling away from each other but Mars still looks really, really great in the night sky and will for a while to come! At the beginning of the month Mars rises around 8:30 pm and sets at 5 am. Towards the end of August Mars sets around 2:30 am. The King reached opposition back on May 8th, and continues to get smaller as distance grows between us. Still he is The King and will be visible early in the evening, setting around midnight at the beginning of the month and about 10:15 pm by the end. It is very bright. Jupiter’s equatorial bands, the four Gallilean moons, and sometimes the Great Red Spot should make for a fun view through even a small telescope. On Thursday, August 16, Europa’s shadow will begin to transit at 7:56 p.m. EDT (in evening twilight). At 8:05 p.m. EDT, Io’s shadow will join Europa’s and the pair will transit Jupiter until they both move off the planet at 10:10 p.m.
Saturn rises around 6 pm and sets around 3 am at the beginning of the month, and about sets about 1 am. The rings aren’t as wide as they were a few months ago but are still at a great angle. Uranus, rises around 9:30 pm and is visible all night. Rises around 9:45 pm at the beginning of the month and 7:45 pm at the end. Visible all night, but never easy. Mercury will be too close to the Sun to see. at magnitude -3.9, Venus is the brightest object in the evening sky after the moon and can be seen in the west after sunset. Venus rises a little higher in the sky as the month goes on setting about two hours after the sun at the start of the month, and two and a half hours at the end. Mars rises about 1:30 am at the beginning of the month and after midnight by the end. During the month, Mars has a magnitude which increases rapidly from -0.4 to -1.2 as the month goes on. Over the coming months, our view of Mars will continue to improve as we get closer together. Each month, Mars will appear bigger and brighter in our scopes, with more detail visible. The King reaches opposition on May 8th, and will be visible all night, rising at about 8:30 pm at the beginning of the month and about 6 pm by the end. It is very bright at magnitude -2.5. Jupiter’s equatorial bands, the four Gallilean moons, and sometimes the Great Red Spot should make for a fun view through even a small telescope. Saturn rises around 12:30 am at the beginning of the month, and about 10:20 pm by month’s end, climbing higher in the sky and getting brighter as the month goes on. The rings aren’t as wide as they were a few months ago but are still at a great angle. Not this month. Uranus, rises around sunrise, and sets before sunset. Maybe in the predawn sky towards the end of the month. Never easy.